It is a striking fact that finance academics are not very interested in history and that history academics seem to have a fairly restrictive view of finance. This is sad: The two fields have much to learn from each other. 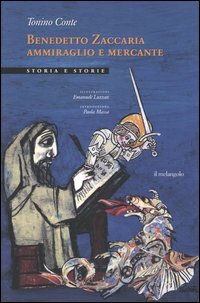 My co-author, Didier Joos de ter Beerst, and myself have been fascinated by a contract that was signed in 1298 in Genoa between Benedetto Zaccaria, a powerful merchant and admiral, and two Genoese financiers, Enrico Suppa and Baliano Grillo. To the point that we have conducted an in-depth research about this contract (Didier was able to get a copy of the original version). This contract is a masterpiece of strategy and financial engineering and a great source of inspiration for economists, finance and history scholars. After months of reading, struggling with the contract, going into intense discussions, we wrote a paper that has already been presented in several conferences. Lastly, Didier presented the paper at the XIVth International Economic History Congress in Helsinki. If finance, options, derivative and structured products are your pet topics, if you have an interest in insurance and banking; if you are keen on history, especially medieval history, we think you will enjoy this paper. The current English version (IEHCPAPERBRIYSJOOS.pdf) is fairly long (worth it ;-) but still at the rough draft stage (with typos, sorry!)) We include a shorter (IEHC.ppt). A French version will be published soon. We'd be delighted to receive your comments! Merci pour cette perle :). Pour OPT dans le monde contemporain il ne faut pas oublier que c'est un des seules théories économiques (la seule ?) qui est véritablement 1/ prédictive (le prix de l'option) 2/ et qui marche très bien en pratique (avec quelques efforts pour rendre les modèles plus réalistes). Do you know if hey practicsed fractional reserve during those times or did that start only with the British gold merchants? Fabulous article! I would like to exchange with Didier Joos - could you provide his email ? I wander what was the Genoa's finance system's overall influence onto the development of advanced banking in Florence a couple of centuries later. I am very interested to see what they knew about finance in 1298.I wonder if there was such a term used then. I have only one word to say "AWESOME". Nice post. Really I liked it.